Size 13 - 13.5 There is 1 product. 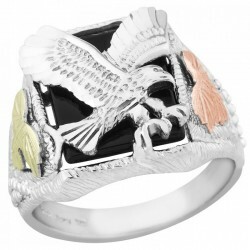 Stunning Black Hills Gold and Sterling Silver Eagle ring for men Stone: Black Onyx Width: 0.664 inch Decorated with 12K rose and green leaves Made in USA Ring size: 13Handcrafted in the Black Hills of South Dakota. Comes in a gift box with a Certificate of Authenticity and a warranty card.